It is well known that firms, on average, are more productive in larger cities. Agglomeration economies are considered to generate benefits as positive externalities (e.g. Combes and Gobillon 2015). However, recent theoretical studies have proposed another hypothesis of selection. As introduced by Melitz (2003) in the international trade literature, selection is defined as less-productive firms being unable to survive in the market. Further introducing the endogenous markup, Melitz and Ottaviano (2008) showed that larger markets bring about tougher selection, and, consequently, aggregate productivity in larger cities is higher than that in smaller cities, since only more-productive firms survive in larger markets. A crucial empirical concern is to examine whether higher productivity in larger cities derives from agglomeration economies or firm selection. 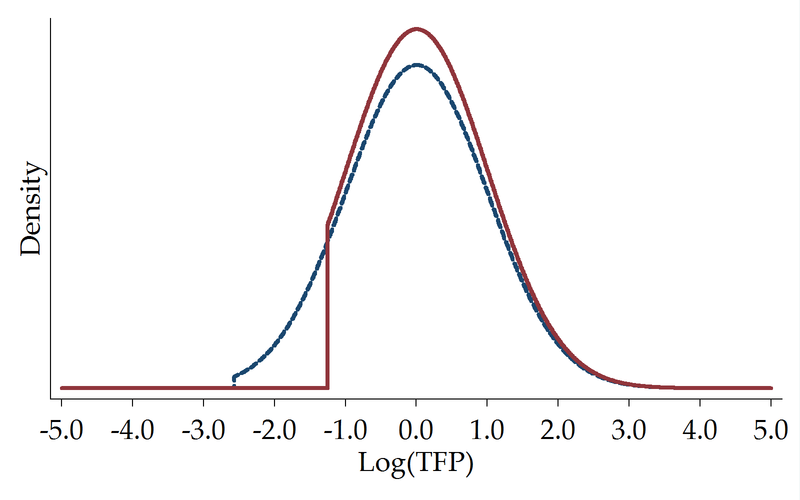 The standard regression approach cannot distinguish productivity advantages of agglomeration economies from firm selection. Although urban economists have understood the productivity advantages of large cities as deriving from agglomeration economies, there may be different implications if stronger selection plays the key role. Thus, there is an increasing need to develop a new empirical methodology that can distinguish agglomeration from selection. To simultaneously test for agglomeration economies and firm selection in spatial productivity differences, Combes et al. (2012) developed a new quantile approach that focuses on entire productivity distributions through three key parameters (shift, dilation, and truncation), whereas the standard statistical approach only captures the shift and dilation through the mean and variance of distributions. Agglomeration economies are captured by the right-shift of productivity distributions between larger and smaller cities (i.e. the right-shift captures the difference in average productivity between larger and smaller cities). Furthermore, Combes et al. (2012) considered the dilation effect of agglomeration economies, which indicates that more-productive firms can enjoy greater benefits from agglomeration (i.e. 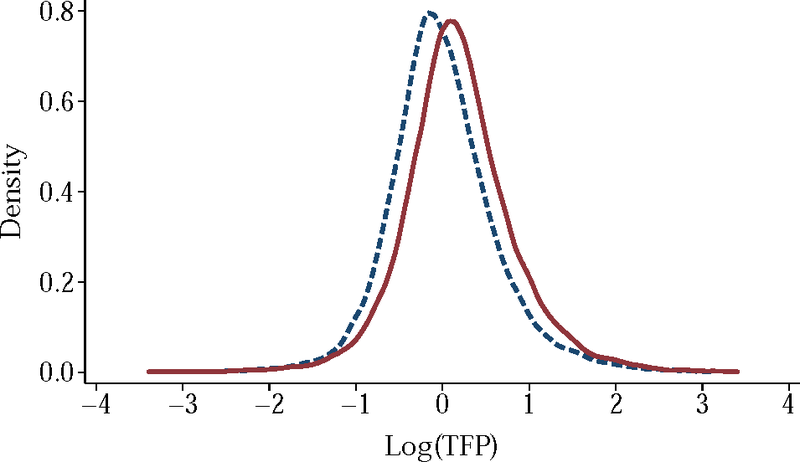 the dilation examines whether productivity distributions in larger cities are more dispersed than those in smaller cities). Finally, the selection is detected as a left-truncation of the productivity distribution (i.e. the left-truncation captures how less-productive firms can’t survive in larger cities). 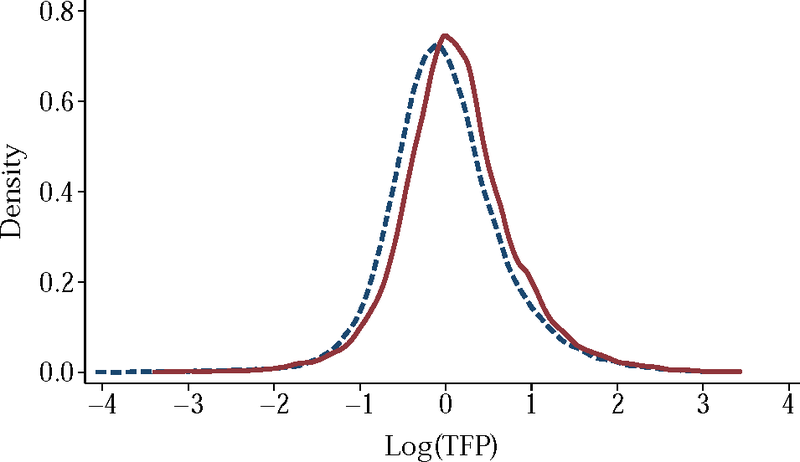 An empirical issue is that when stronger selection exists in the productivity distribution for larger cities, the omitted truncation parameter causes overestimation of the right-shift effects, and underestimation of the dilation effects of agglomeration economies. Figure 1 offers an intuitive explanation regarding this bias. Panel (a) exhibits agglomeration economies via a right-shift of the productivity distribution (same selection in both cities). 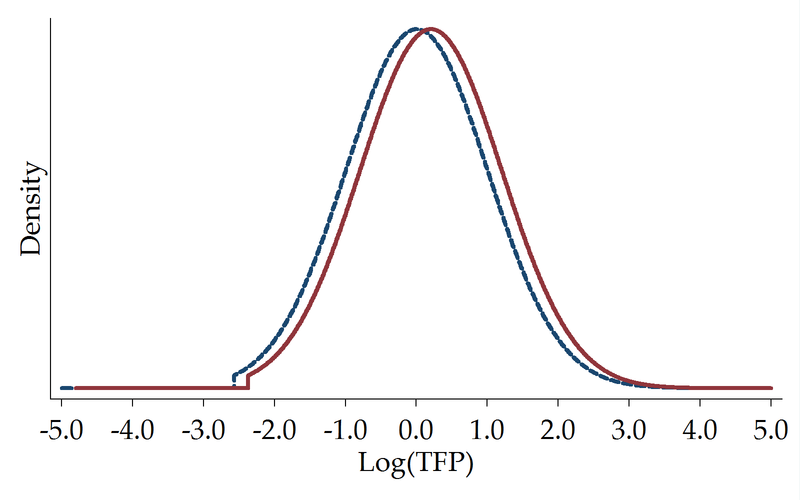 By contrast, Panel (b) exhibits stronger selection in larger cities, but no agglomeration economies (i.e. no right-shift of the productivity distribution). In other words, both panels show that average productivity is higher in larger cities, but the background mechanism in cities is entirely different. The quantile approach suggested by Combes et al. (2012) compares the entire productivity distributions between larger and smaller cities to simultaneously examine whether agglomeration or selection plays the more important role. Notes: Created by author. The solid and dashed lines denote productivity distributions for larger and smaller cities, respectively. Panel (a) shows agglomeration economies (right-shift only) and the same selection. Panel (b) shows stronger selection in larger cities and the same level of agglomeration economies. My study applies this new quantile approach to the Japanese manufacturing sector from 1986 to 2013 (Kondo 2016). I hardly find any stronger selection effects in larger cities (i.e. no stronger left-truncation of productivity distribution in larger than smaller cities). Conversely, as shown in Figure 2, higher average productivity in larger cities is mostly explained in terms of the right-shift of the productivity distribution, suggesting that agglomeration economies do better explain spatial productivity differences in the Japanese manufacturing sector. In addition, the dilation effect of agglomeration economies shows greater variations across sectors. On the one hand, more-productive firms enjoy greater benefits from agglomeration in some sectors, while, on the other hand, less-productive firms enjoy greater benefits from agglomeration in other sectors. Notes: Kondo (2016). The solid (dashed) line is the productivity distribution of cities with above-median (below-median) employment density. Estimation results by sector are available in Kondo (2016). Another key testable prediction of Combes et al. (2012) is whether benefits from agglomeration economies decrease as interregional accessibility increases. For example, information and communications technology facilitates the exchange of ideas between geographically distant cities, decreasing the potential benefits of agglomeration economies. I find that benefits from agglomeration economies in the Japanese manufacturing sector have decreased in the recent decade. This suggests that when regional economies are integrated more tightly as communication and transportation costs decrease, the productivity advantages of agglomeration also decrease. The main findings in the Japanese manufacturing sector are similar to those of Combes et al. (2012), which concluded that firm selection does not play a crucial role in determining spatial productivity differences in the French manufacturing sector. By contrast, focusing on the pre-war Japanese silk reeling industry, Arimoto et al. (2014) concluded that selection played a key role in explaining why aggregate productivity in silk industrial clusters was higher than that in non-clusters. They also found that relatively less-productive firms enjoyed greater benefits from agglomeration economies, which indicates that the productivity distribution for the silk industrial cluster was less dispersed than that in non-clusters. These findings are in contrast to Combes et al. (2012) and those presented here. Limited evidence in this literature is not enough to conclude that selection does not matter in spatial productivity differences. This literature requires further empirical studies worldwide, since there may be more counterexamples in other countries and time periods. Considering why differences arise across countries and time periods will deepen our understanding of agglomeration economies and help us draw better implications for urban and regional policies. Finally, in Kondo (2017), I developed a new Stata command, estquant, which implements the quantile approach suggested by Combes et al. (2012) on Stata. I hope that the estquant command helps researchers apply this new approach and extend the empirical evidence in this literature. Arimoto, Y, K Nakajima and T Okazaki (2014), “Sources of productivity improvement in industrial clusters: The case of the prewar Japanese silk-reeling industry”, Regional Science and Urban Economics 46: 27–41. Combes, P-P and L Gobillon (2015), “The empirics of agglomeration economies”, in G Duranton, J V Henderson and W C Strange (eds), Handbook of Regional and Urban Economics, 5, Amsterdam: Elsevier, Chapter 5: 247–348. Combes, P-P, G Duranton, L Gobillon, D Puga and S Roux (2012), “The productivity advantages of large cities: Distinguishing agglomeration from firm selection”, Econometrica 80(6): 2543–2594. Kondo, K (2016), “Testing for agglomeration economies and firm selection in spatial productivity differences: The case of Japan”, RIETI, Discussion Paper 16-E-098. Kondo, K (2017), “Quantile approach for distinguishing agglomeration from firm selection in Stata”, RIETI, Technical Paper 17-E-001. Melitz, M J (2003), “The impact of trade on intra-industry reallocations and aggregate industry productivity”, Econometrica 71(6): 1695–1725. Melitz, M J and G I P Ottaviano (2008), “Market size, trade, and productivity”, Review of Economic Studies 75(1): 295–316.